As repairs have continued on Veendam in Quebec today, technicians have determined a complete repair can only be made in dry dock. Unfortunately that process and getting the ship back in position will take longer than seven days, so Holland America is also canceling the October 11 sailing from Quebec to Boston. The contract for the firm that manages the cruise terminal in Mobile is coming up for renewal, and the city has asked for an extension while they consider what they are going to do. From the tone, it sounds more as if the city is considering more of a change of policy regarding the terminal, rather than considering simply changing the firm that will manager it. No doubt this is going to engender a community-wide discussion. The local newspaper has already started it. The cruise terminal seems to be a hot potato. It hasn’t had a cruise line there regularly since Carnival left in October 2011. The city borrowed $18.6 million in 2008 to build the terminal, and payments on it go on until 2030. So there seems to be a mindset that the city must find another cruise line to occupy the terminal in order to pay the annual bond payment, or the terminal needs to be generating at least enough revenue to make substantial payments. This thinking needs to change. If it doesn’t, not only will it never be successful in the eyes of the community, but chances are slim the city will ever find a cruise line to occupy it. They may as well stop looking for a cruise line now and convert the building to offices or a banquet hall or something that can easily be rented. On Saturday, Star Princess will be Princess Cruises’ first ship to return to Cabo San Lucas after Hurricane Odile. When it arrives, in addition to passengers anxious to enjoy the port, it will also be carrying pallets of relief supplies for area residents who are still feeling the storm’s impact. DJs aboard Carnival ships are all hired with experience, but before they go into the DJ booth on any Carnival ship, they get trained on doing things the Carnival way at Carnival’s Spin’iversity. The program was created by DJ IRIE - the official DJ of Carnival and the Miami Heat. He has DJ’ed worldwide and knows how to entertain a crowd. Now Carnival is bringing a version of their Spin’iversity to teens aboard their ships who want to learn the art of DJ-ing. Holland America has found it necessary to cancel another Veendam sailing, October 4. If nothing else, it was a matter of logistics because the ship still in Quebec (City) and Saturday’s sailing was to begin in Boston. This is what the world's largest cruise ship looks like under the water. 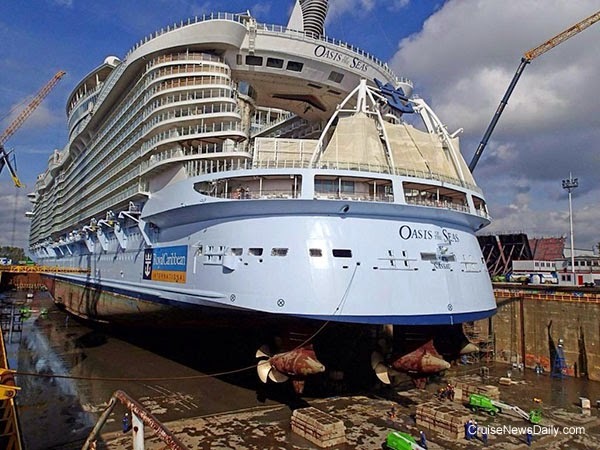 Oasis of the Seas is in dry dock for routine maintenance near Rotterdam. 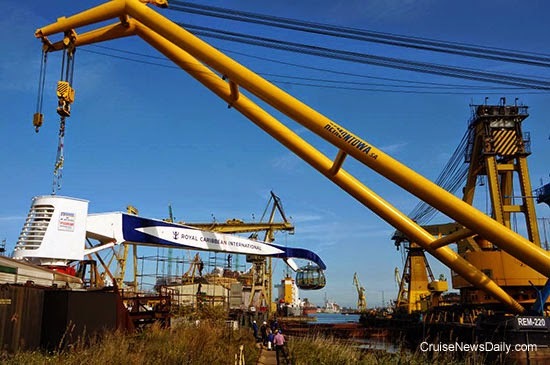 Quantum of the Seas isn't quite ready for passengers yet. It's missing one of its signature features. Quantum is currently out in the North Sea undergoing sea trials. On its way to meet the ship when it gets back is its North Star observation arm, which will become one of the hottest tickets on the ship. It's shown here at the manufacturer in Poland being loaded up to meet Quantum in Germany where it will be installed on top of the ship. MIAMI – October 2, 2014 – Norwegian Cruise Line announced today that John McGirl has joined the company in the role of senior vice president and chief human resources officer. McGirl has responsibility for the shipboard and shoreside global human resources of Norwegian Cruise Line. Most recently, McGirl was chief human resources officer for the Naples Community Healthcare System, a large, multi-facility healthcare organization on Florida’s gulf coast. Prior to joining NCH, McGirl was vice president of human resources at Royal Caribbean International and prior to that at Cunard/Seabourn. He has a Master’s Degree in Human Resource Management from Sheffield Hallam University, UK and is currently a Doctoral Candidate in Business Administration at Sheffield Business School. McGirl’s experience has included building customer/guest centric organizational cultures, aligning of human resource programs and practices with strategic business needs, designing and executing programs to support mergers, integrations and expansion, along with ensuring that team members are engaged, involved and excited. McGirl will be working closely with George Chesney, Norwegian’s current senior vice president, human resources. Chesney, who has been with Norwegian for more than 12 years, will retire in the coming months. “George has been instrumental in helping to take our organization from Good to Great. We thank him for his many contributions,” added Sheehan. Seattle, Wash., Oct. 2, 2014 — Holland America Group CEO Stein Kruse presented a check for $25,000 to Seattle Children’s Hospital’s Uncompensated Care Fund Saturday, Sept. 27, 2014, at the Seattle Mariner’s home game at Safeco Field. The company made the donation as part of its partnership with the Seattle Mariners Major League Baseball team and their “K’s for Kids” program that debuted during the 2014 baseball season. 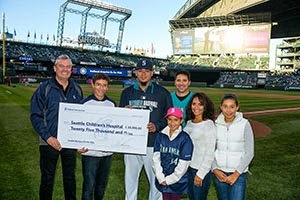 With “K’s for Kids,” each strikeout (represented as a “K” on the score card) recorded by a Mariners pitcher at Safeco Field throughout the season earned a cash donation from the cruise line to Seattle Children’s. Kruse was joined on the field during the check presentation by 14-year-old Seattle Children’s patient Jake Finkbonner and his family and the Seattle Mariner’s Major League Baseball All Star and Cy Young award-winning pitcher Félix Hernández. For the past three years, Holland America Line and the Mariners have maintained a partnership that, in addition to a corporate sponsorship, includes community-based programs. The cruise line sponsors “Get Well Tours” to area hospitals and donated two cruises for raffle at the annual Fan Appreciation Night, on Friday, Sept. 26. Holland America Line is the presenting sponsor of the Seattle Mariners Get Well Tours, visits to area hospitals by Mariners players and the Mariner Moose where children receive photos and autographs. They also get a Holland America Line–branded sports bag filled with Mariners and baseball-related items such as replica baseballs and a Mariners Moose toy. Holland America Line is the presenting sponsor of the annual Fan Appreciation Night celebration at Safeco Field. This year the event was held at the Sept. 26 home game. Fan Appreciation Night is a celebration of the loyalty and support of Mariners fans with random drawings for prizes throughout the game. As part of its sponsorship, Holland America Line provided two cruises which were given away to lucky fans. Carnival will return to year round cruising to the Mexican Riviera from Southern California next week. 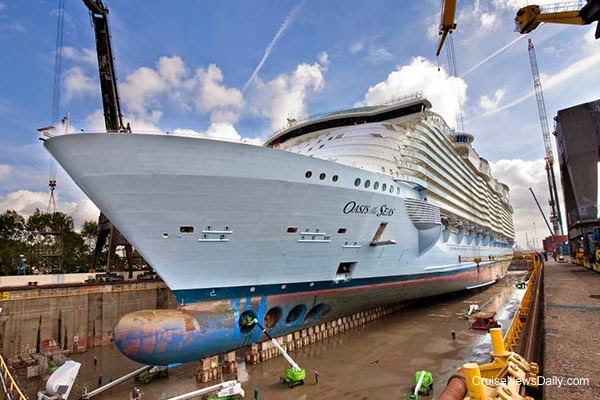 The October 4 sailing from Long Beach will also be the first cruise ship to return to Cabo San Lucas after Hurricane Odile extensively damaged the city. In addition to passengers, Carnival Miracle will be loaded with relief supplies for residents of Cabo. More details emerged today about the 20-year-old man who fell from the mast aboard Carnival Ecstasy and died as a result of his injuries. CND subscribers also read about a guilty plea ... what's the matter with Veendam ... and permission to be shipped aboard. 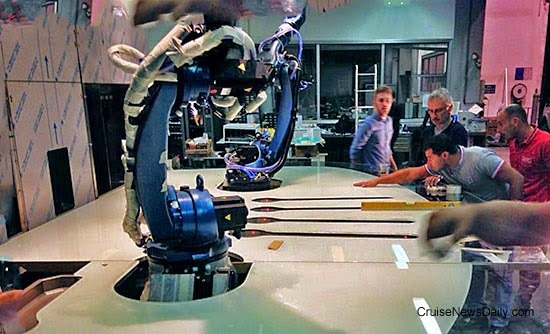 Technicians at Makr Shakr in Italy are making the final adjustments to the Bionic Bartender before it is shipped to Germany for installation aboard Quantum of the Seas. Norwegian Cruise Line began to reveal the dining features that will be aboard Norwegian Escape today, and guess what? They are going to be very similar to what’s aboard Norwegian Breakaway and Norwegian Getaway. That shouldn’t be any surprise because Norwegian Escape is a progression from the Breakaway-class. Holland America’s Veendam, which was supposed to depart Quebec last Sunday, is still there, although the passengers are finding their ways home by now. The ship has an issue with its propeller, and the assessment and determination of the work required is still ongoing. Although Holland America hasn’t said it yet, the October 4 sailing from Boston back to Quebec seems rather doubtful to operate too. 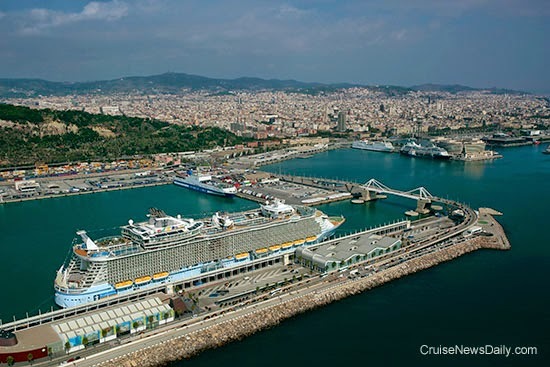 Earlier this month Oasis of the Seas arrived in the Mediterranean for a short series of cruises there, marking the first time an Oasis-class ship has sailed outside the Caribbean. As excited as agents (and passengers) were to have the opportunity to sell Oasis there, press coverage has been very limited. To prove she’s there, we now have a photo of her in Barcelona below. Photo courtesy of Royal Caribbean International and Michel Verdure. All rights reserved. May not be copied or used without permission. Ireland, particularly the town of Cobh, has a significant part in the long and varied history of Cunard Line. Known as “Queenstown” from 1850 to the 1920s, this very attractive town’s relationship with Cunard began in 1859, making it one of the oldest of the company's ports of call. 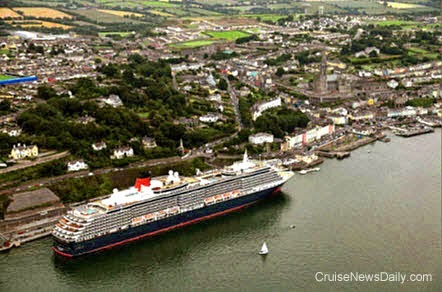 Cobh remained a regular fixture in the Cunard schedules every year until the 1960s, apart from 1914 - 1918 and 1939 - 1945. 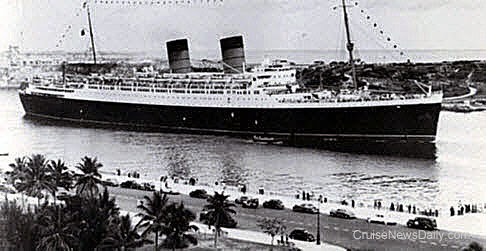 In the 1930s, as many as five Cunard ships were calling at the port every month. When emigration from Europe to the United States and Canada began to mushroom from the middle of the 19th Century, the majority of the two and a half million emigrants Cunard carried to the New World came from England, and from mainland Europe substantial numbers of Irish emigrants boarded in Cobh where Cunard ships stopped on the westbound route from Liverpool. In the 100 years from 1848, over six million people emigrated from Ireland to escape crop failures or poverty; and of these, two and a half million departed from Cobh – many on Cunard vessels. In early 1914, Cunard’s Ivernia established the record of embarking 1,000 passengers in Cobh – a record that stood for many years and perhaps still stands! Despite the misery in which so many of these emigrants had existed, and despite the tears and sadness at leaving a home they might never see again, emigration was fundamentally a story of hope. For a good many of them, the hope became reality, and the prosperity found in North America enabled them and their descendants to visit their native lands on the great transatlantic liners that incessantly moved between the Old World and the New. Mauretania, at the time the largest liner calling at Cobh, made history in September 1947 when she embarked officials and players of the Gaelic Athletic Association, who were bound for New York to take part in the first All-Ireland Football Final to be played outside Ireland. Cunard and Cobh will be forever linked due to the sinking of the Lusitania on the afternoon of Friday 7 May 1915, ten miles off the Old Head of Kinsale. She was torpedoed by U20 and sank within 18 minutes. Of the 1,900 people on board, only 761 survived. Many of the recovered bodies were taken to Cobh, and over 140 unidentified bodies were interred in three graves at the Old Church graveyard just outside the town. Most identified bodies were claimed by relations and sent home for burial – but over 900 missing persons were never found. Today a Memorial to Peace and to the loss proudly stands in the centre of the town, and it has become the tradition in recent years for visiting Cunard ships to pay tribute to the Memorial and commemorate the loss. Caronia, the famous “Green Goddess,” would offer several Around Ireland cruises during her career and was a regular visitor to the country. On 23 July 1990, as part of Cunard’s 150th Anniversary Round Britain voyage, QE2 was greeted by 60,000 people and units of the Irish Navy on her maiden arrival at Cobh, in the Irish Republic. Her arrival also coincided with the opening of the new cargo terminal at Ringaskiddy (where she berthed) and the Irish Taoiseach, Charles Haughey, was entertained to lunch to mark the event. Her departure that evening was again greeted with huge crowds, especially as she passed Cobh itself, where every square foot of the town overlooking the water was jammed with sightseers. Queen Mary 2, Queen Elizabeth and Queen Victoria are regular callers to Cobh and further strengthen the unique bond between Cunard and Ireland. 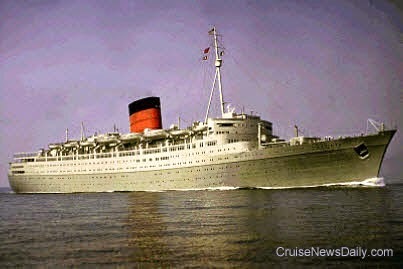 A notable development took place on 8 May 1929 when Scythia made Cunard's first call at Galway. Within a few years, four Cunarders a month were calling there. Dublin also figured in the company's plans. In 1932, Samaria and Antonia brought over from the U.S. and Canada hundreds of pilgrims for the Eucharistic Congress being held in that city. Both ships served as floating hotels during the Congress. Lancastria would make annual pilgrimages, under the auspices of the Catholic Boy Scouts of Ireland, to Loudres and the Holy Land, with a stop at Civitavecchia being made to enable the pilgrims to attend the opening of the Holy Door in St Peter's, Rome. A 20-year-old man, reportedly from North Carolina, lost his life in a bizarre incident aboard Carnival Ecstasy, early this morning. The ship was returning to Miami at the time at the end of a cruise. This messenger comes on the sea. Princess Cruises has a new app for your smartphone or tablet that will let you communicate with their fellow cruisers. The new app will debut on Regal Princess in the Caribbean this fall and then roll out to the entire fleet during 2015. Princess had planned for Sea Princess to return to service today from an unscheduled dry dock we told you about a couple of weeks ago. The repairs became more complex that originally anticipated, so the ship remained in dry dock in Sydney. That required canceling the scheduled 14-day cruise from Brisbane to New Zealand.